Fashioned by tlish diyan HolyOnes izze-kloh are some of the most sacred and important items one can possess. The very nature of the intimate relation Maria has with the stones begins a ceremony of curative power. 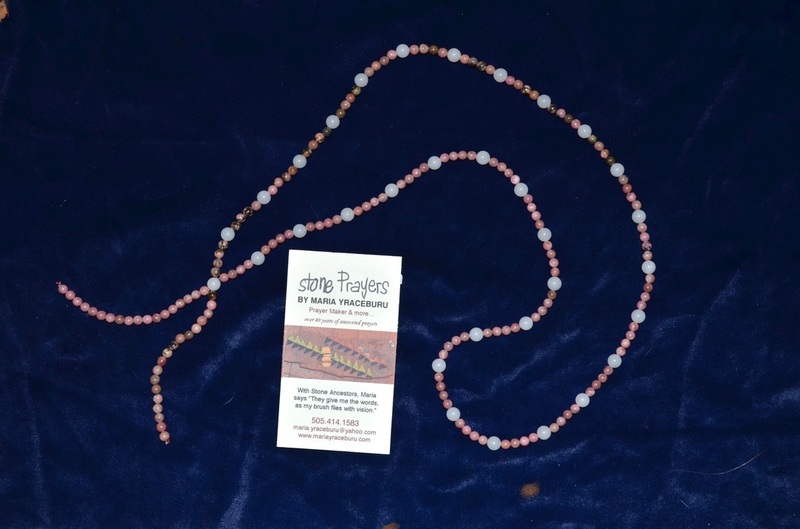 When held the spiritual transmission of these Ancient Starseeds help you rise to each occasion in life – by Making Relation with one of the Medicine Cords. Little can be related in words, but you're in for the sweet moment in life when you put yours on. 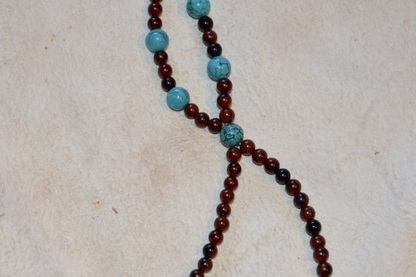 Speak your truth from the Heart of Compassion with Turquoise, the stone that melds the energies of Heaven and Earth. Determined strength aligns the kyong (chakras), as Turquoise brings attunement sacred in its healing and protective qualities. When paired with Mahogany Obsidian, growth on all dimensions of existence occures, promoting choices and dialogue opportunities to manifest one's life work – including grounding and clarity during meditation – to bring peace of mind, and prosperity. The most celebrated stone of love, Rose Quartz, is the most powerful healer of emotional wounds. Heart opening Rose Quartz, the balancer of igasshteelí and bi'aadi (yin-yang) energies, delivers the definitive sensation of LOVE, enigmatic, highly motivational, which allows for the dissolution of stress and tension. Much more than a dispeller of irritation, Amazonite is also the surprising purveyor of rejuvenation, enhancing communications – along with the alignment of etheric and astral love – this necklace propells one to unprecedented compassion an a world needing soothing. 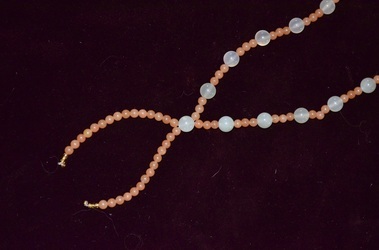 From White Lace Agate and Rhodonite… energy is received during bio-rhythmic lows that uncloud the understanding of beauty in being "Perfectly Imperfect" in life… helping one to reintegrate the playful innocent sense of adventure from childhood… stimulating generosity and confidence in universal family, here is an uncommon and unequaled necklace.